Twenty- and 50-round boxes of Littlestone Ammunition's loading of the .38 Special +P cartridge with 110-grain Speer Gold Dot Bonded-Jacket Hollow Point bullets. Hover cursor or click on photo for close-up view. Firearm not included. 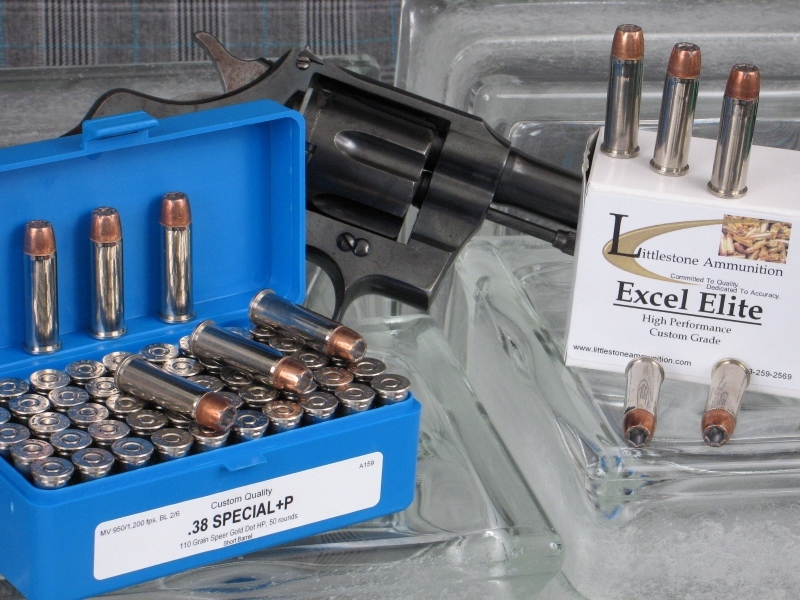 Improve the stopping power of your subcompact .38 Special +P revolver by loading it with Excel Elite, Custom-Quality handgun ammunition from Littlestone Ammunition. This custom-quality revolver ammunition launches a 110-grain Speer Gold Dot Short Barrel bullet at 950 fps (2-inch barrel). From a standard 6-inch barrel it moves out at about 1,200 fps and delivers 352 ft. lbs. of energy. The Gold Dot is a mission-critical bullet designed to exceed FBI performance standards and a law enforcement favorite. The short barrel version of the Gold Dot was developed for subcompact handguns that have become so popular with law enforcement personnel and for concealed carry. Gold Dot Short Barrel bullets have wider tips and deeper cavities to promote full expansion at the lower velocity produced by the shorter barrels of subcompact handguns. Because this bullet is excellent for use in both short barrel and longer barrel revolvers, we offer it in different loads to maximize its effectiveness for the specific barrel length. This loading, A159, is designed for the longer barrel revolvers. The Gold Dot, with a true bonded core (the industry's first) and other design features, expands throughout its velocity range, yet passes through barriers and functions normally at the target, retaining upward of 95 percent of its weight. Feature 3: MV / Energy / Barrel: 950 and 1,200 fps / 220 and 352 ft lbs / 2" and 6 "